George Clooney does like his politics, whether it's standing outside the Sudanese embassy in Washington to protest that country's actions in Darfur -- and getting arrested for his troubles -- or supporting left-of-centre US politicians. And he dabbles in politics in his movies as well. 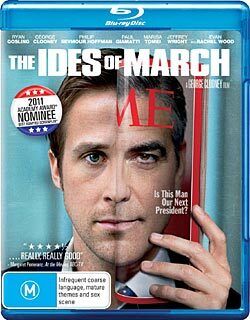 That wouldn't be in the least exceptional, except that in 'The Ides of March' Clooney has crafted (as well as starring, he directed and co-wrote it) a gripping thriller. It's what is technically a political thriller, but really it's about how a young star-struck worker (Gosling) becomes disillusioned with the object of his idealism, and how he deals with it. 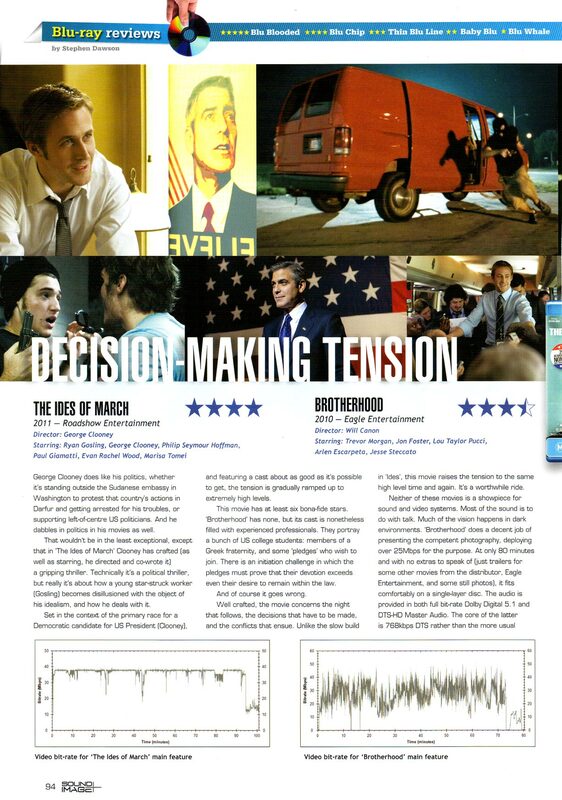 Set in the context of the primary race for a Democratic candidate for US President (Clooney), and featuring a cast about as good as it's possible to get, the tension is gradually ramped up to extremely high levels. This movie has at least six bona fide stars. 'Brotherhood' has none, but its cast is nonetheless filled with experienced professionals. They portray a bunch of US college students: members of a Greek fraternity, and some 'pledges' who wish to join. There is an initiation challenge in which the pledges must prove their devotion exceeds even their desire to remain within the law. And of course it goes wrong. Well, crafted, the movie concerns the night that follows and the decisions that have to be made and the conflicts that ensue. Unlike the slow build in Ides, this movie raises the tension to the same high level time and again. It's a worthwhile ride. Neither of these movies is a showpiece for sound and video system. Most of the sound is to do with talk. Much of the vision happens in dark environments. Brotherhood does decent job of presenting the competent photography, deploying over 25Mbps for the purpose. At only 80 minutes and with no extras to speak of (just trailers for some other movies from the distributor, Eagle Entertainment, and some still photos) it fits comfortably on a single layer disc. The audio is provided in both full bitrate Dolby Digital 5.1 and DTS-HD Master Audio. The core of the latter is 768kbps DTS rather than the more usual 1509kbps. Ides looks better than Brotherhood, not so much because of the very high (35Mbps) MPEG4 encode, but because of the more imaginative cinematography. Its disc is twice the size, datawise. Its audio also comes lossless in the DTS-HD MA variety (with the normal 1509kbps core) and is backed up with Dolby Digital 2.0. Four featurettes come to nearly half an hour.